We know you have been waiting patiently for these amazing looks and now they are here! Feast your eyes upon SAJA's 2015 bridal collection. It's packed full of effortlessly chic and timeless pieces. This romantic, sheer V-neck dress is a reinvention of one of our favorite SAJA styles. The added drama, with ever so softly dropped shoulders, is in perfect harmony with the flow of the dress, for truly effortless elegance. This refined pearl-beaded dress has an illusion neckline in the front and a plunging v-cut in the back. It's A-line skirt is enhanced by the weightlessness of silk organza, giving it light, dreamy volume. The scattered pearl beading is a delightful addition to this already perfect gown. Our first SAJA look including a trained skirt, this modern dress has a matte chiffon top over heavy silk satin. Its illusion blouson top with split sleeves and delicate picot edges is a welcoming juxtaposition to the heavy eggshell satin underneath. Its effortlessly chic, dropped waist silhouette becomes a train, giving a bride both comfort and beauty. Layers of fabric and intricate beading leave nothing behind to be desired on this special piece. Silk satin lining sits underneath delicate lace for a layered look. Sheer silk organza falls gently over the lace to create a soft, a-line skirt. 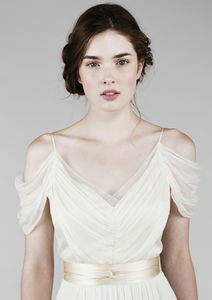 Weightless volume is echoed by heirloom quality workmanship through a hand-beaded bodice in a lace motif. Hours of hand beading by artisans give life to the one-of-a-kind scalloped lace motif that decorates this sleek and elegant silhouette. Paired with a low, plunging back, this dress is truly the epitome of femininity with elaborate details, yet subtle elegance. Decadent pearls and glass beads frame a sweetheart neckline on this glamorous, silk satin dress. Its sleek, sheath silhouette gives a nice transition to the elaborate, decorative neckline- creating just the right amount of impact for the classically, elegant bride. This elegant and modern long sleeved dress has a plunging back, layered front neckline, and one-of-a-kind floral embroidery that cascades down the front bodice as well as along the sleeves. Its impossibly long silhouette will also elongate the bride.